Review published in IJPE, Vol. 4, No. 3, July 2008, p.296. The two authors who are professors located across the Pacific Ocean have together written or edited two earlier books (published by Marcel Dekker in 1990 and 1994) on the subject and this is supposedly the final book on the subject from the authors and is being claimed as primarily written for managers at all levels right from CEO, through middle level to junior level managers. The authors also prescribe this book for graduate students of Business Management, Operations Management and Industrial Engineering. Since the reviewer didn't have the opportunity of going through the earlier books, it is not possible to comment on how they differ from the present version of the book. However, it can be said with certainty that the book under review is well-documented to deal with the subject of warranty from basics to intricacies of warranty management. It starts with why a product warranty at all is necessary and goes on to discus its implications for buyers and manufacturers, outlining the various theories of warranty and description of warranty policies. The product life cycle approach and system's approach to warranty management along with the discussion of issues for strategic warranty management during the pre-launch, launch and post launch stages make the subject coverage complete in all its aspects. 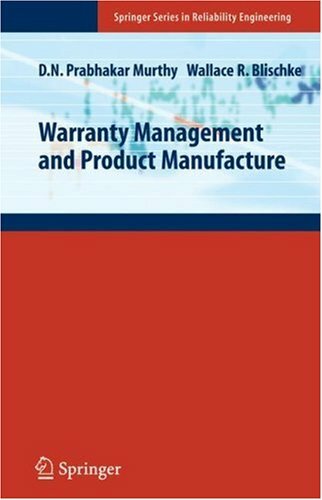 Warranty cost analysis and warranty considerations in product design and development and their implications for product will be found useful to manufacturers for taking strategic decisions on the form of warranty they would like to offer for their products. The role of warranty in marketing along with warranty logistics and description of warranty management system along with interfaces provides a complete coverage of the material that may be found useful to a manufacture of a product in developing an effective warranty system. However, the reviewer feels that the chapter 13, which discusses the financial, societal and legal aspects of warranty should have appeared little earlier in the layout of the book, perhaps closer to chapter on product warranty. Overall, the book succeeds in its objective to a very large extent and the reviewer would like to recommend this book to any one who intends to get graduated in the intricacies of warranty designing and administration. Review published in the International Journal of Performability Engineering, Vol. 4, No. 3, July 2008, p. 296.